BANTEAY MEANCHEY, Cambodia—Several hundred villagers here recently faced down armed police threatening deadly force in the midst of a dispute with the government, which wants to evict them. Such scenes have echoed in violent clashes between villagers and authorities around Cambodia in recent weeks, in which at least eight people have been detained. Villagers scuffled with police during a protest against their presence in northwestern Banteay Meanchey province’s Palelay village, after police began dismantling their homes by force Dec. 20, a spokesman for the protesters said. Many villagers said they had protested on the night of Dec. 20 near where police were stationed, demanding the authorities pull them out of their village after they dismantled their houses and made death threats against them, he added. “The soldiers are still acting up against the villagers. So both men and women, young and old, and students, shouted along the road, insisting the soldiers be pulled out immediately,” Touch Narin said. In the south of the country, villagers in Kampot province said a group of 10-20 soldiers had beaten villagers who protested orders that their land be bulldozed for a plant nursery believed to be associated with prime minister Hun Sen.
“The soldiers shot twice into the air to threaten the villagers. Almost 30 armed soldiers were mobilized. The soldiers stood guard and pointed at where should be bulldozed,” the man said. Residents said the soldiers were deployed from the 31st Division, based in neighboring Kampong Speu province. Chin Thavy, who was three months pregnant at the time of the Dec. 21 clash, suffered a miscarriage after trying to stop her niece from being beaten by soldiers, she said. “They pushed me when I was helping my niece, who was being beaten during the brawl. And then I called for help. When I arrived home, I found out that I had suffered a miscarriage. During the brawl, there were as many as 20 or 30 soldiers surrounding us,” she said. The soldiers shot twice into the air to threaten the villagers. Almost 30 armed soldiers were mobilized. The soldiers stood guard and pointed at where should be bulldozed. Soth Tum, 59, said he too was badly beaten in the incident. Local authorities say they are trying to mediate land disputes. Banteay Meanchey provincial police chief Hun Hean, who the villagers said sent in the armed police, declined to comment and referred questions to the provincial deputy governor. The Banteay Meanchy provincial deputy governor, Sok Sareth, said he would order the police not to harm the villagers, and would postpone development plans for fear of social unrest. Disputes over appropriation of land by the authorities for development are handled in Cambodia by the National Land Authority. National Land Authority vice president Eng Chhai Eang said land disputes in Palelay’s Poipet commune were far more complicated than they seemed, adding that he would present the case to the National Land Dispute Authority for resolution. But Cambodia’s rural residents tell a different story. 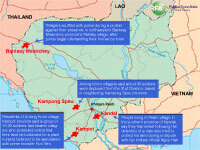 People living in Peam village in the southern province of Kandal say they fear arrest following the detention of a man who tried to protect his land during a dispute with the military top brass. “Ngoy Hak, also a high-ranking military official, said he was in pursuit of me,” according to the uncle of Ly Hok Yeng, who was detained Dec. 15 by a truckload of soldiers without an arrest warrant and sent to Kandal provincial prison. Ngoy Hak is a high-ranking military official in the capital, Phnom Penh, and Ly Hok Yeng was sent to jail over a 12-hectare plot of land, he added. “They are still threatening that five more people [will be arrested],” he said. The head of Ly Hok Yeng’s commune, Tes Yen, said that a warrant for Ly Hok Yeng’s arrest had been issued but that he didn't know on what grounds. Calls to Ngoy Hak’s office went unreturned Dec. 19, while Kandal provincial prosecutor Huot Vuthy was also unavailable for comment. He added that on Dec. 20, Ngoy Hak would compensate the remaining 40 families who were also involved in the land dispute. Local activists cited two land disputes in the area connected to the arrest. Original reporting in Khmer by Seang Sophorn, Mayarith, and Mom Sophon. Translated by Makara Chea. RFA Khmer service director: Kem Sos. Executive producer: Susan Lavery. Written for the Web in English by Luisetta Mudie and edited by Sarah Jackson-Han.